Some older members of the Arsenal fraternity will remember that before 1981 league tables in England were based on two points for a win, one for a draw. Indeed even after the League changed that to three for a win most of football stayed where it had been with two points for a win (although I can remember that in 1971 in Algeria the league table was based on three points for a win, two for a draw and one for a defeat). It was the move to three for a win in the 1994 world cup finals that led to a full scale adaptation of the new system, and now as far as I know, every league uses it. I mention this on 17 April, because this is the anniversary of the creation of the Football League, and although by the following September the participants had been organised and a list of fixtures drawn up, the season started without agreement on how the league table would be worked out. Various ideas were put forward. You can see two other proposals in the listing below. Here are the anniversaries for today. 17 April 1888: The Football League was created, although the teams involved were unable to agree how to measure who was top of the league until much later in the season.The initial proposal was that clubs would just count the number of wins. Another that they would count just goals scored. 17 April 1892: Bert White born in Watford. Bert played for Brentford as an amateur before the war, and then served with the Royal Fusiliers before coming to Arsenal playing in the first post-war league match. He played 29 league games and scored 16 goals, making him the top league scorer for the club that season. He later played for Thames Association. 17 April 1907. Archie’s Low last game, away to Notts County. He had the misfortune that all three games he played were defeats, although at the same time Arsenal achieved their highest league position thus far in the first division in that season (7th), and reached the semi-final of the FA Cup for the second season running. 17 April 1913: The suffragettes undertook an arson attack on the pier at Great Yarmouth. 17 April 1915: Arsenal’s final season in division 2 was disrupted by the sudden departure of the manager George Morrell; a sad act given the way the club had stood by him through thick and thin. It appears he may have left just before the match on this day which ended Preston 3 Arsenal 0. 17 April 1926. Arsenal beat Huddersfield Town 3-1. The match marked the sudden awareness (at least among newspaper journalists) of Arsenal’s rise in terms of power and tactical ability. Huddersfield still went on to win the league but Chapman was edging Arsenal towards the unthinkable: second in the league. 17 April 1936: Tony Biggs born in Greenford. He signed for Arsenal in 1956 and went on to play four times for the club before moving on to Leyton Orient. 17 April 1937: As it became clear that for the first time since 1930 Arsenal would win neither of the major trophies, nor even be runners up, Arsenal beat Portsmouth 4-0 at Highbury. Both the Compton brothers played, and Dennis got two. Nelson scored again to make him look an interesting prospect, while Kirchen, playing at centre forward in the absence of both Drake and Bowden, got the fourth. 17 April 1939. Having introduced the novel notion of starting the season with a friendly against Tottenham at Highbury, the return match was organised at WHL which Arsenal won 2-1. 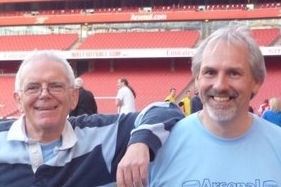 George Marks the keeper in the “Arsenal Stadium Mystery” film, played. 17 April 1942: Death of Sam Hollis, Woolwich Arsenal’s trainer between 1894 and 1897, and as near to being a manager as the club had in the period..
17 April 1954: Newcastle 5 Arsenal 2. By 12 September 1953 Arsenal were bottom of the league, two points adrift from the clubs above, having suffered the sort of defeat (that 1-7 to Sunderland) that Arsenal had in the past become more used to dishing out than receiving. Although Arsenal climbed up the table and ended the season 12th, it was a season of bad news, as Arsenal also lost to Norwich City of the Third Division South in front of 55767 at Highbury in the fourth round of the cup. 17 April 1971. Arsenal 1 Newcastle 0 with Charlie George scoring in the 71st minute. Just as interesting was the fact that Leeds lost to WBA. 17 April 1976. Mee ended his tenure as manager with three defeats, of which this was the first – a home loss to Ipswich Town 1-2. 17 April 2008: Ian Wright left Match of the Day saying he was fed up with being used as the comedy jester. 17 April 2016: Zelalem played for Rangers against Celtic in the Scottish cup semi final. Zelalem converted a penalty in the shootout to help Rangers progress to the final. He had been on loan to Rangers from 24 August 2015.